Connect with your browser to your IsardVDI server on https:// and follow wizard. 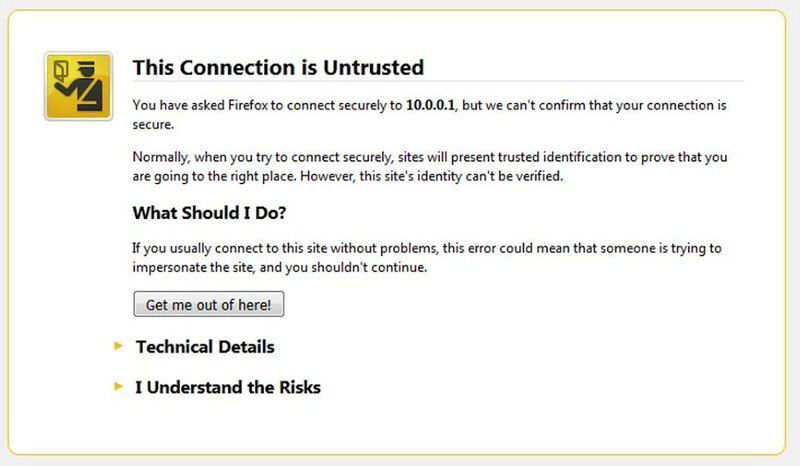 The browser will ask to to accept the self-signed generated certificate. Add an exception and add the certificate to trusted certificates and it will open the wizard. 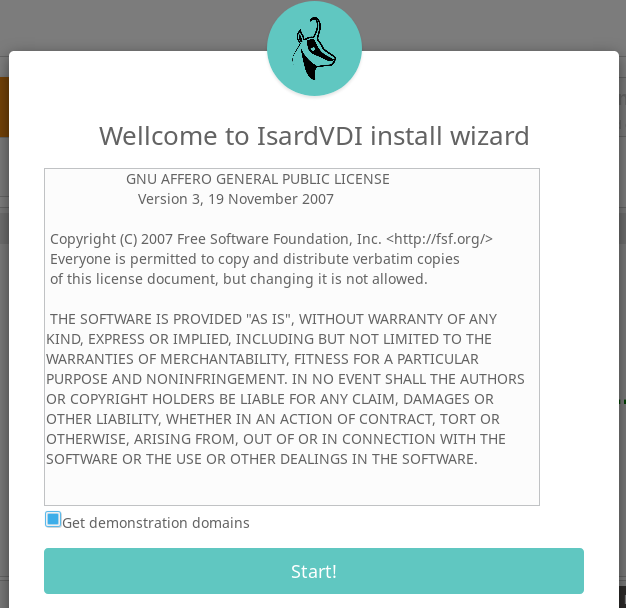 As the wizard opens a modal form will show license agreement and a checkbox already checked by default that will allow your IsardVDI installation to automatically download demo desktops during the wizard. 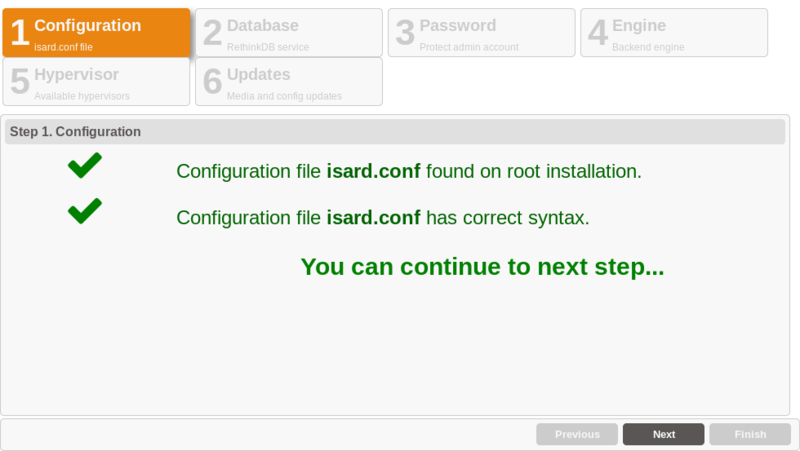 Follow steps to finish your IsardVDI initial configuration. Wizard will detect configuration automatically from isard.conf.docker. Nothing may be changed here. Database must be populated now. 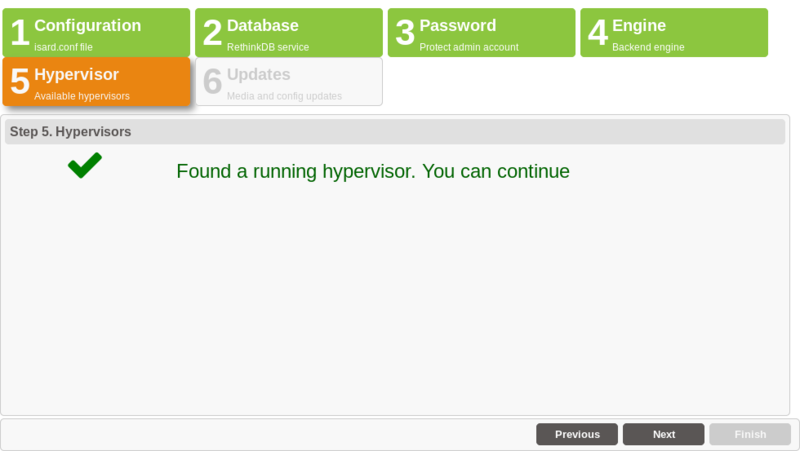 Click on Populate database button and wait till it finishes. Click on Next button when it finishes database populate. Wizard forces to set up a new admin user password. Click on Change password button and fill it twice. Click on Update button to close password update form. Click on Next button when password has been updated. 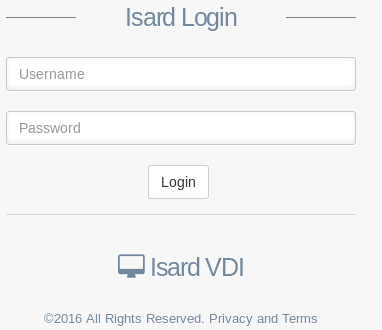 IsardVDI comes with a dockerized KVM hypervisor and now the wizard will check if it is online. Click on Next button as it should be up and running already. Wizard checks for IsardVDI engine to be running in background. If it fails, let some seconds to be up and click on Check again button. When it finds the running engine it will continue to next step. Click on Next button if already found the engine. 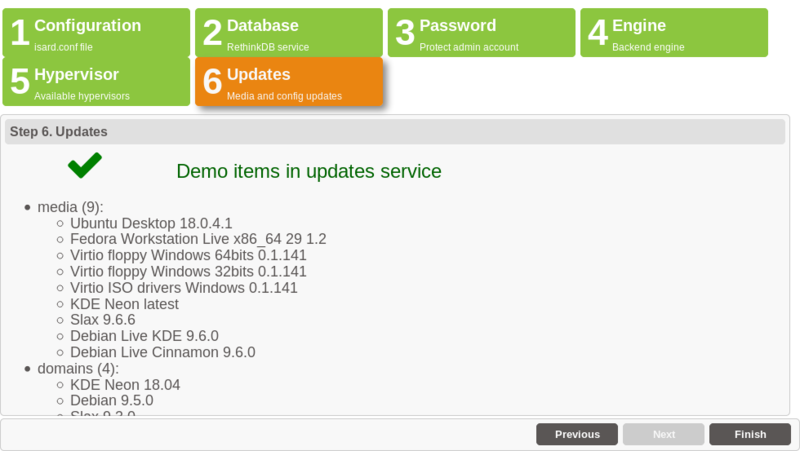 If you checked the register checkbox in the first modal it will show a list of resources online available to be downloaded. You can register later from updates menu. 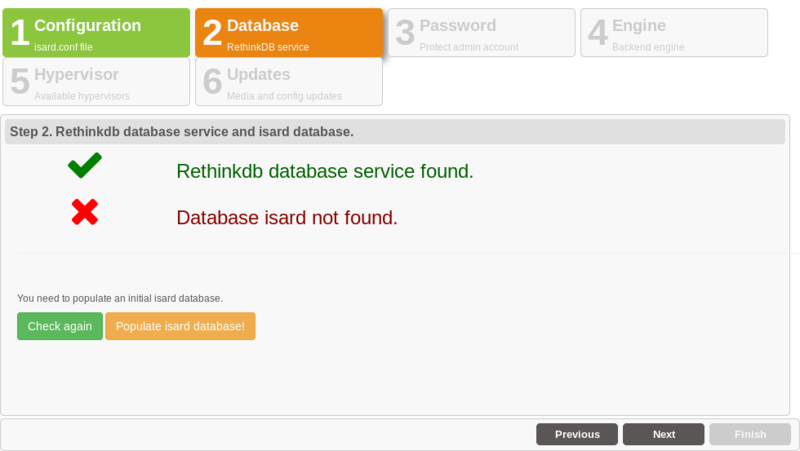 Click on Finish button and wait for the main login IsardVDI page to come up. 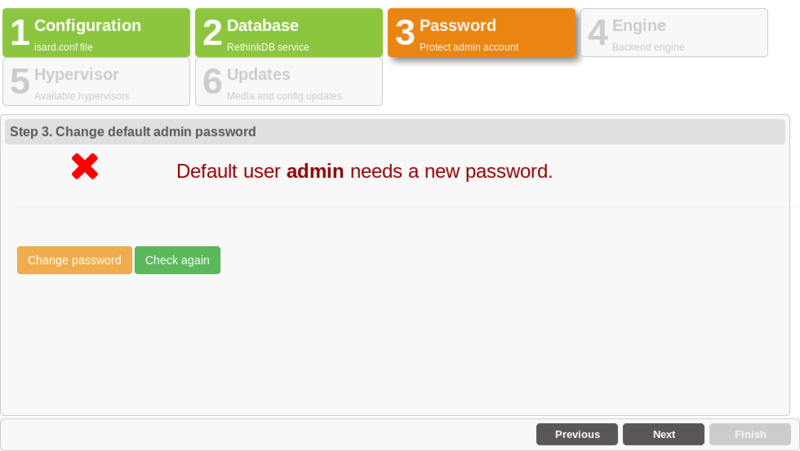 Login with admin username and the password you provided in step 3.